Selecting between the two styles of customer feedback survey, relationship and transactional, is relatively straight forward for most business to consumer organisations. Use Transactional feedback surveys for understanding what drives day to day customer loyalty. Use Relationship feedback surveys to benchmark yourself against your competitors. However, it is not nearly so simple in a business to business (B2B) or business to government (B2G) environment. Relationship Vs Transactional: What is the difference? 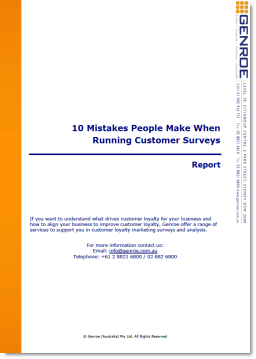 Transactional (or Bottom-up) surveys occur shortly after a customer has interacted with your organisation. This could be completing a sale, receiving an invoice, contact a service centre, etc. On the other hand, Relationship (or top down) surveys occur on a regular timeframe: say monthly, quarterly or annually. Transactional surveys are very short; often just 2 or 3 questions. They rely on a high number of responses and lots of qualitative data in order to be successful. Relationship surveys are longer (20 or more questions) and rely on getting more information from each customer to be successful. Neither approach is right or wrong and both have their advantages. B2B: When would you use Relationship? Relationship surveys can almost always be used in a B2B business. In fact this is the type that is most often used. On an annual or other regular basis, the company will contact their clients to gather their feedback. Data is collected analysed, reported and actioned. This style of survey also work well for B2B companies because it can handles a range of influencers and decision makers within the client organisation: economic decision maker, technical influencer, etc. Using the Relationship approach allows you to collect input from each of the perspectives and integrate them together. The Genroe High Value B2B Customer Feedback Process is a Relationship feedback approach specifically designed for B2B organisations. B2B: When would you use Transactional? Transactional surveys are not always applicable in a B2B situation. They key attribute required for this approach is, not surprisingly, a regular, high volume, stream of transactions. You might think that all organisations have a good stream of transaction but this is not the case. Many B2B companies have only a relatively few, very high value transactions. For instance, consider a company that performs mainly project based work (IT companies, engineering companies, construction companies) or companies with relatively large per customer sales (heavy equipment suppliers). If you are one of these companies it may be difficult to identify meaningful transactions against which you can implement a Transaction style survey. CustomerGauge is an excellent software tool for implementing and managing transactional NPS surveys. I have seen this approach very quickly drive customer focus into an organisation; it’s hard to ignore the feedback when customers are telling you every day what you are doing right and wrong. The constant stream of feedback informs ongoing tactical change in the company, which in turn demonstrates the value of feedback to the whole organisation. Rather than a once a year “hit” of feedback that can get forgotten, the constant stream of feedback keeps it top of mind for all staff and management. Having said that, in a B2B company there are sometimes just not enough transactions or they are not of the right sort to make transactional approaches work. In these cases relationship approaches are invaluable. They give deep insight into what is motivating the customer and can provide an excellent understanding how to help you make changes to improve customer loyalty. What is the impact on your NPS® program? Not much actually. Net Promoter Score® can be used in both Transactional and Relationship approaches. You should note that the scores from each approach are not comparable but you can, and should, use the Net Promoter Score questions and approach in both Relationship and Transactional feedback approaches.